Wedding sparklers have been traditionally used for several years during multiple stages of the wedding ceremony; from the couple’s first dance, to their first kiss as bride and groom, and even on a wedding cake as it’s rolled into the hall. However, wedding sparklers are most commonly used during the iconic send off, where the bride and groom exit the wedding party and proceed to start their happy lives together as husband and wife. In modern times, wedding planners have a wide array of options to choose from when it comes to sparklers for sale. An item of particular interest in this regard is the heart-shaped sparkler, offered by Wedding Sparklers Outlet. Will stay lit for approximately a full minute each. Lit at the top in the heart’s crease. Made in two color options: red or traditional gray. Can be personalized with customs tags or ribbons. Can be accentuated with gold star sparklers for contrast. It’s advised that planners order multiple heart-shaped wedding sparklers per person so that there is ample time to light up the bride and groom’s entire path, and of course to ensure that the proper amount and quality of pictures are taken. While the toss exit has been traditionally popular for centuries, wedding sparklers have become much more popular in the modern era. Wedding party members would toss things like rice and wheat to the bride and groom as they left the venue, and they would do so with the intention of metaphorically showering the married couple with bounty, abundance, and fortune. Of course, the send off toss is far from dead — it’s still widely used today, though not quite as often as wedding sparklers. Sparklers provide an ethereal, magical quality to the experience that rice or wheat alone cannot achieve. Of course, sparklers aren’t as inherently rich in tradition as tosses are, which is why heart shaped sparklers can be the option of choice for planners looking to have the best of both worlds. With heart shaped sparklers, the bride and groom are showered with symbolic love as their exit path is magically illuminated. Weddings are an inherently beautiful experience, and they will be regardless of how the bride and groom are sent off by their loved ones. That said, the newlyweds deserve the most memorable experience that they can be given. This is where heart shaped sparklers come in. 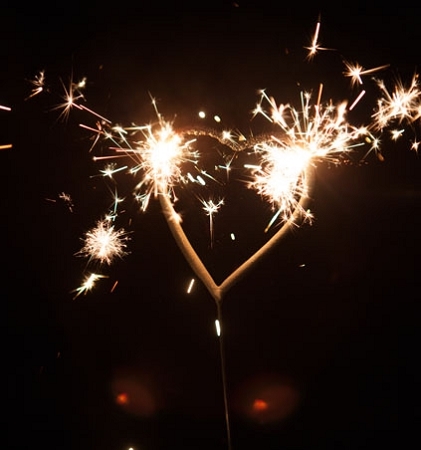 As a send off option, heart shaped sparklers are an eye-catching choice that will make for great wedding photos and memories for the bride, groom, and everyone involved.